Shakespeare and Company, Paris. Photo by Dena Timm. 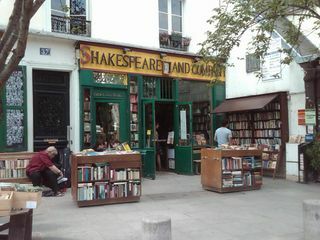 Shakespeare & Co. (37, rue de Bucherie): Surely the most well-known bookshop in Europe, founded in 1951 by the now-in-his-90's, George Whitman, who still describes the three sprawling floors as "a den of anarchists disguised as a bookstore." Joyously unorganized, a place to catch up on Parisian literary gossip, or grab a book and sit in one of the two red movie theater seats in the "Old Smoky Reading Room" (which isn't anymore), or wander upstairs where a resident writer or two bunks if agreeing to work downstairs and write about the experience. The famous motto is found at the head of the stairs: "Be not inhospitable to strangers lest they may be angels in disguise." 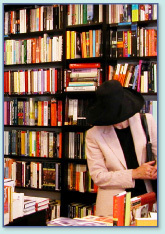 Librairie Galignani (224, rue de Rivoli): The continent's oldest bookstore (est. 1801) and arguably its most elegant. Six generations of the Galignani family have been selling both French and English-language books in the present location under the massive arcade opposite the Tuileries Gardens since 1856. The store's 50,000 titles include three English language sections — fiction, politics, and history — as well as a separate room of guidebooks. A great pleasure to browse in such a beautiful store with its dark wooden bookshelves from the 1930s, where time passes faster than a sneeze. Window displays change every 15 days. Village Voice Anglo-American Bookshop (6, rue Princesse): The sentimental favorite, a booklover's bookshop, 18,000 titles on two levels: fiction, the newly published, and travel on the first floor, non-fiction upstairs. Founded in 1982 and voted "Best Independent Literary Bookshop In Europe" a few years ago, they also carry literary magazines like "The New Yorker," "The New York Review of Books," and the "Times Literary Supplement." A great section of translated French literature, and if you're looking for translated European literature, it segues into the general fiction section. W.H. Smith (248, rue de Rivoli): A large branch of the British chain near the Place de la Concorde, W.H. Smith carries the city's largest number (70,000) of English-language books as well as a great number of magazines and newspapers. Historical fiction separated from and found at the end of the fiction section on the first floor, non-fiction and children's books upstairs. Shakespeare & Company Booksellers, Vienna. Photo by Dena Timm. Shakespeare & Company Booksellers (Sterngasse 2): A serious bookshop for serious readers run by knowledgeable, brow-furrowed sellers, heavy on philosophy, cultural studies, translated Austrian writers; also a sprawling fiction section ranging from translated Europeans, to the 2004 Nobel Prize winner Austrian Elfriede Jelinek, to the latest Harry Potter. Good graphic novels and comics selections, perhaps a bow to levity. Sliding ladders reach the close-to-ceiling offerings and photos of famous writers who've read or signed books. The shop's motto: "You choose and read what you think is best. We read what we can and sell the rest." And so they do. 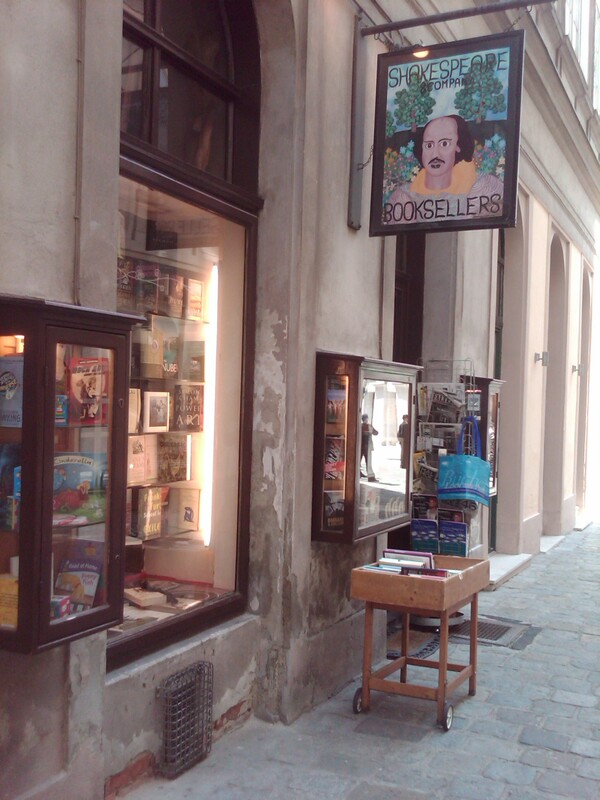 The British Bookshop (Weihburggasse 24): Austria's largest English-language bookseller housed in one big bright-and-airy ground floor. A complete children's section and comprehensive offering of guidebooks. Very handy: a bookcase of fiction set in Vienna, including currently popular mystery series by Frank Tallis ("A Death in Vienna," "Fatal Lies") set in early 20th-century Vienna starring Detective Oskar Rheinhardt and his friend, Freud-follower Dr. Max Liebermann. Motto: "We read our books." Okay. Stocker Buchhaus (Hertensteinstrase 44): A large bookshop on the popular pedestrian-only Hertensteinstrase in Lucerne's Old Town, with one store section devoted to English-language books. A very well-stocked mystery fiction section and complete Swiss guidebook area that includes a separate book of Mark Twain's "Holiday in Lucerne" taken from his round-the-world travel account, "A Tramp Abroad." All this segues into a charming cafe where I recommend a latte with perhaps a piece of Laderach chocolate or a chunk of Toblerone. Before leaving, check out the lovely blank notebooks that close with a strap magnet. RICHARD WEST spent nine years as a writer and senior editor at Texas Monthly before moving to New York to write for New York and Newsweek. Since then, he's had a distinguished career as a freelance writer. West was awarded the National Magazine Award for Reporting in 1980 and is a member of Texas Arts & Letters.